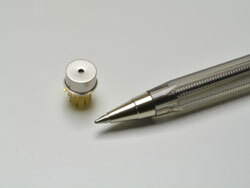 Hamamatsu Photonics introduces the latest development in MEMS (Micro-ElectroMechanical Systems) technology with the MEMS FPI C13272; a single element detector that is able to give spectral information by utilising a Fabray-Perot Interferometer in the spectral response range from 1,55 µm to 1,85 µm. A voltage controls the size of the gap between two mirrors in a MEMS structure. The size of this gap determines the wavelength of light that is allowed to pass through. By quickly changing the voltage across these mirrors, the structure acts as a tuneable filter. This means that the user effectively has a spectrometer but with the low cost and small footprint of a single element sensor. Such a device opens up exciting avenues in applications like atmospheric measurement; where handheld devices require components that are low size and low power consumption.